Hi, this is Struppi. He is a sweet eight-year-old dog and I love him very much. 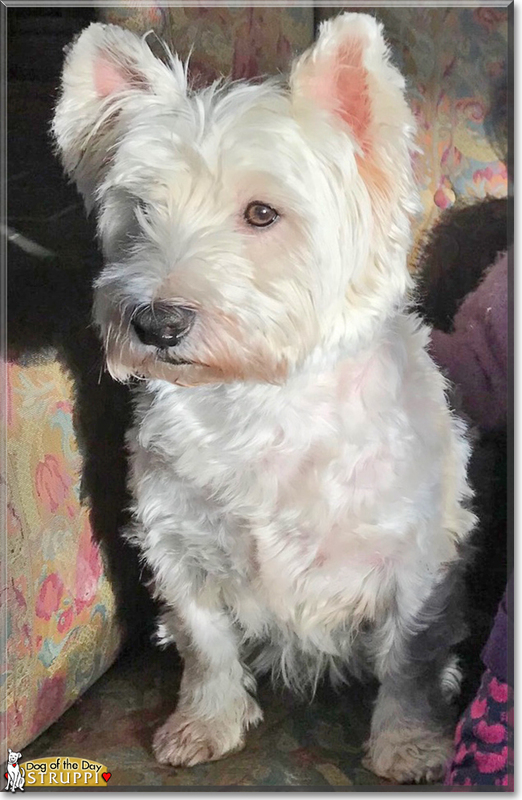 He's a West Hghland White Terrier. He lives at my grandparents' house. We, my mum, my sister and me, visit him every time when it's possible. After I get up in the morning he wants to play with me and my sister. We play the whole day with him in the garden, when the weather is good. When it isn't good, we always play with him inside the house. Struppi guards my grandma's shoes every day. When somebody wants to pick up these shoes, Struppi starts to growl or to woof. Only my grandma is allowed to take the shoes away. This is really funny. I really love him very much. Talk about Struppi in Pet Talk!